Have you noticed small bumps or hardened little masses attached to your tonsils deep in the back of your throat? If so, you are seeing tonsil stones, or tonsilloliths. Even though they are hidden deep in the back of the throat, these little structures can spell big trouble for those suffering with chronic bad breath. Tonsil stones, or tonsilloliths, are not really stones at all. And the name “stone” would seem to imply that they are extremely hard. In fact, while they do have a definite structure, tonsil stones are tend to be mushy accumulations that adhere to the tonsil tissue. These stinky little pebbles can cause a tickle in the throat or excessive coughing. Tonsil stones are made of the same substances that make up the biofilm on the tongue – bacteria, debris, dead skin cells, dead blood cells, mucous, and other proteins. You may have only one tonsil stone or you can accumulate many. They can appear occasionally or all the time. 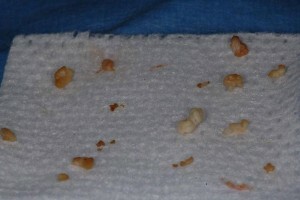 This picture shows an example of a large accumulation of tonsil stones. For those suffering from allergies, there is a greater chance for tonsil stones due to post nasal drip. If tonsil stones are present in your mouth, they are a direct cause of bad breath. But keep reading. Tonsil stones are not the main cause of the problem. While tonsil stones do cause odor, even very severe odor, they are not the primary cause of bad breath or halitosis. Why? Because these accumulations are working hand-in-hand with bacteria already lodged deep in the surface of the tongue or under the gums. Just like the tongue, tonsil stones are accumulations of bacteria that thrive where there is little air (like in the back of your mouth!). 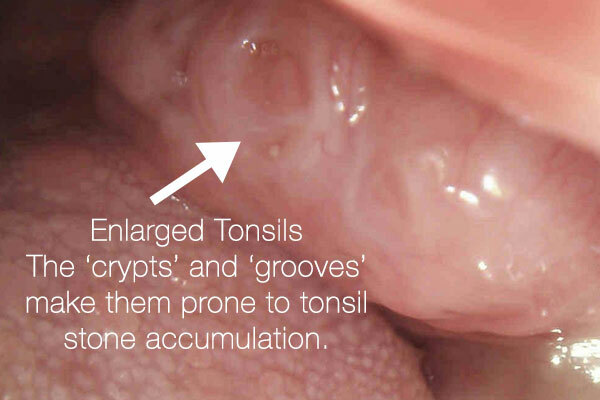 They attach to the crypts and grooves found on the tonsil tissue and continue to feed on the partially digested food, cells, sugars and proteins, which are all readily available in the mouth. The result is an odor called Volatile Sulfur Compounds or VSCs. In other words, chronic bad breath or halitosis. While there are many home remedies available all over the Internet, I would advise you to visit your dentist for professional removal. There is real potential of throat injury, choking or gagging from homemade removal devices like cotton swabs and bobby pins. 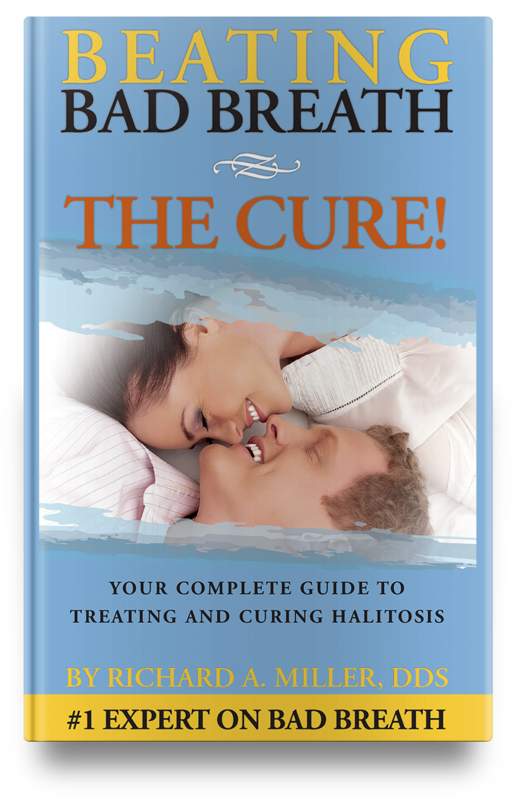 However, to alleviate throat discomfort/irritation caused by tonsil stones, a simple rinse readily available to most is warm salty water. We do not recommend tonsil removal as a first resort for people with bad breath. 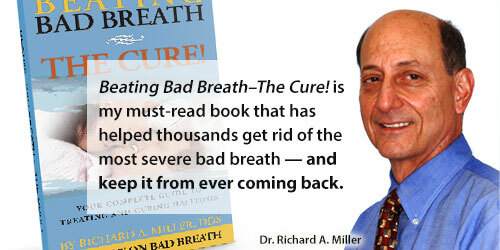 In over 95% of chronic bad breath cases, the root cause of the problem is oral in nature. More specifically, bacterial biofilm that has been growing for years deep in the tongue and underneath the gums. This can be cured by Tongue Rejuvenation and the treatment of any gum disease. There are times when tonsil removal is necessary, such as when the tonsil stones keep recurring after removal. The photos used in this article are from the same patient and due to the reappearance of the “stones” at every appointment, it became necessary to refer this patient to an ENT doctor for removal of her tonsils. I am happy to say that after Tongue Rejuvenation treatment, the elimination of gum problems and the removal of her tonsils, this patient has been bad breath-free for over three years. Tonsil stones “do” cause bad breath, but there is usually a larger underlying issue found in the mouth. Before resorting to tonsil removal or risky at-home remedies for removing tonsil stones to get rid of bad breath, it is critical to know where the root cause of bad breath is coming from. Make sure your dental professional examines the pharynx — the area behind the tongue where it attaches to the back of the throat as part of your halitosis examination.